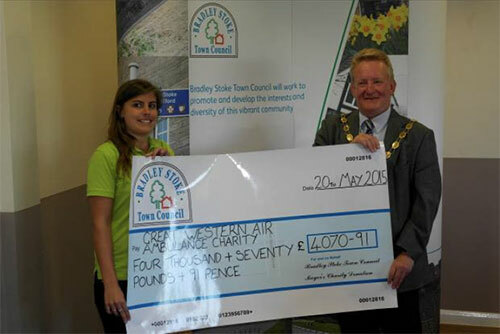 At Bradley Stoke Town Council’s Annual General Meeting held on Wednesday 20th May 2015; Councillor Roger Avenin was elected to the position of Mayor of Bradley Stoke. Roger takes over from the former Mayor John Ashe, who has been serving on Bradley Stoke Town Council for the last 11 years; making him the longest currently serving councillor – first elected in 2004. New Mayor Councillor Roger Avenin – Photograph Courtesy of Councillor Andy Ward. 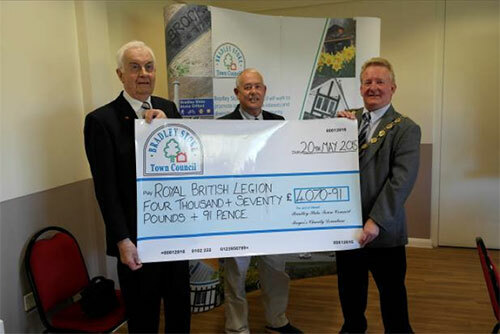 Briefly before handing over to the new Mayor, Councillor John Ashe reflected on his time in office and presented the Mayoral Charity Cheques to his two chosen charities; the Royal British Legion and the Great Western Air Ambulance. Upon Councillor Roger Avenin’s election to the position of Mayor, he thanked the outgoing Mayor for the hard work he has undertaken throughout the last year and his dedication to public service. Councillor Roger Avenin thanked councillors for electing him to the position as Mayor, and he will work closely with Councillors and Officers to ensure the Council continues to be run effectively giving the council tax payer the best value for money. Councillor Roger Avenin has been a sitting councillor in Bradley Stoke since 2007 (currently representing the Baileys Court Ward); in May 2015 he was also elected to South Gloucestershire Council. (Pictured Brian Hewitt & John Moloney) – Photograph Courtesy of Councillor Andy Ward. (Pictured Ella Mayne) – Photograph Courtesy of Councillor Andy Ward.